IMO/adopted guidelines for the mandatory carriage of damage stability verification instruments (software, computers, etc.) onboard all (new and existing) tankers beginning in January 2016. IMO has adopted guidelines and applicable IMO Code amendments for the mandatory carriage of damage stability verification instruments onboard new and existing tankers. Amendments to MARPOL Annex I, BCH Code, IBC Code, IGC Code and to the Survey Guidelines under HSSC to mandate the provision of a computer program capable of calculating the applicable damage stability requirements were agreed. The approval generally applies to the software, but may include hardware, for example, when the instrument receives input from sensors for the contents of tanks. New tankers will need to comply on delivery and existing tankers will need to comply at the first scheduled renewal survey after January 1, 2016 (July 1, 2016 for Gas Carriers) but no later than January 1, 2021. All tank vessels on international voyages must meet the International Maritime Organization’s (IMO) requirements for damage stability. These regulations are contained in the MARPOL Convention for general purpose tankers, the IBC and BCH Codes for bulk chemical carriers, and the GC and IGC for gas carriers. In 2010 the Paris Memorandum on Port State Control carried out a Concentrated Inspection Campaign to verify correct damage stability on oil tankers, chemical tankers and gas carriers. The reasons for this Concentrated Inspection Campaign included that inspections showed tankers frequently sailing when not complying with damage stability requirements or had no means of assessing damage stability or were sailing in a loading condition not covered by the approved Stability Booklet or Loading Manual. The Concentrated Inspection Campaign Report stated; that a significant number of tankers during a “spot check” could not show compliance with stability requirements and thus may pose a risk to the environment. It is generally understood that since most tank vessels use computer programs to evaluate stability and strength for any loading condition, there no longer is a practical incentive to stay with the standard loading conditions. • existing tankers provided with approved limiting KG/GM curves covering all applicable intact and damage stability requirements. The Administration should take into account the Guidelines for the approval of stability instruments(MSC.1/Circ.1229) when reviewing them. Stability software should be approved, but hardware approval is not mandatory and can be covered by national standards. Limiting the number of loading permutations or range of loading is not a practical operational restriction for many, if not most, tank ships. Practical reliance on gaining voyage specific approvals on a timely basis may also be a burden to both the operator as well as the national administration, and may limit operational flexibility. Many ships are currently operating effectively and safely, using approved limiting KG/GM curves, covering all applicable intact and damage stability requirements. For this type of system the limiting KG (or required GM) curves vs. draft are pre-developed and pre-approved, and would typically be added to both the Stability Booklet and the loading computer. This would normally insure compliance with both the damage stability and intact stability requirements. However, in practice, these curves are complicated and expensive to produce, and also have other application and enforcement concerns as noted in MSC 82/18/3, “because of the need to consider all possible loading and damage combinations and any associated limiting provisions such as tank filling ratios. The resulting stability books may be complex and not easily applied by ships’ officers and Port State control inspectors”. For these reasons Herbert-ABS Software Solutions LLC (Herbert-ABS), generally does not recommend this approach. The best practical solution is to fit onboard damage stability verification instruments on all tank vessels as required. A direct damage stability loading instrument provides a solution that will make it easy to demonstrate compliance with the damage stability requirements to the Port State authorities for any cargo or ballast distribution. The use of an approved computer program, to verify that the non-standard loading condition complies with the damage stability requirements, can be readily applied to new ship loading computers or implemented as an upgrade to existing loading computer programs. Herbert-ABS’ CargoMaxTM loading computer with the Direct Damage Stability (DDS) module fully meets the requirements of IACS URL 5, Type 3, for any type of tank vessel. It demonstrates compliance with the damage stability requirements for any of the relevant regulations from IMO and national administration for any type of loading or ballast loading. It can also be used to demonstrate this compliance to Port State inspectors or vetting surveyors. • Type 1 software calculates intact stability only through the use of an intact required Max GM/ KG curve. • Type 2 software calculates intact stability and checks damage stability using a combined intact and damage stability required GM/Max KG curve. • Type 3 software calculates intact stability and damage stability by direct application of preprogrammed damage cases for each loading condition (DDS). Determining which software type an existing CargoMaxTM falls under may not be clear through the existing approval documentation. It is not always straight forward to determine the URL5 type. The first place to check is the software’s class approval letter. If the approval letter states that the approval is for ‘intact strength only’ then the software was not previously approved for stability and is not classified as a URL5 type software. While the loading program likely has either an intact only or intact/damage required GM curve, the stability portion of the program was not reviewed or approved by the classification society. If the approval letter mentions stability approval, then the software can be classified as one of the three types. Most recent approvals mention the software type in the approval letter. However for software delivered prior to 2004 as well as for some more recent deliveries, the approval letters do not mention the type. If this is the case, the software type can be determined by review of the loading program and the vessel’s Trim and Stability booklet or Loading Manual. In the loading program documentation, an inspection of the Required GM curves and calculation options could reveal the type. If the option to ‘Calculate Direct Damage Required GMr’ is available, then this software has Direct Damage Stability calculations enabled (DDS) and is considered Type 3. If not, then the software likely utilizes either an intact only or intact/damage required GM (or max KG) curve. The name of the curve can sometimes be taken from the program by looking at the Trim and Stability summary. If the curve is labeled ‘Damage’ then this program is a Type 2. The type of Required GM curve used can usually be found in the ship’s Trim and Stability Booklet. If the Required GM curve is derived based on intact stability criteria only, the software is Type 1, but if the Required GM curve incorporates both intact and damaged stability, then the software is Type 2. The great majority of bulk carriers are designed to the reduced B-60 freeboard, Type B freeboard, minus 60 percent of the distance to the Type A freeboard. With this reduced freeboard, the ICLL66 convention, Reg, 27, requires compliance with a fairly conservative damage stability standard only at the summer loadline draft. These regulations specify a 1-compartment damage, with the holds loaded at their 100 percent homogeneous load VCG, and a permeability of 0.90. This is usually considered by a ‘design only’ requirement and once the damage analysis for all 1-compartment damage is met for this design case, operationally, the ship is not required to meet any damage stability requirements. Type B ships constructed before February 1992 were not required to meet any damage stability standards. However, all Type B ships constructed after February 1992 are required to meet the SOLAS Ch. II-1, Part B-1 probabilistic regulations, unless they are covered by other regulations (such as Reg. 27 of the ICLL). New retroactive requirements for bulk carriers came into force as part of SOLAS Ch. XXI. Regulation 4 of this chapter covers the new damage stability requirements, which must be met for bulk carriers constructed after July 1999, flooding each individual cargo hold. This can be considered the damage stability equivalent of the S17 hold flooding structural requirements. It should be noted that ships meeting ICLL Reg. 27, the B-60 freeboard ships, are exempt from the new Reg. 4 requirements, so this essentially only applies to the minority of bulk carriers with only Type B freeboards. “Separate design calculations in accordance with SOLAS Reg. XII/4 are not recommended as it may introduce trim limits not defined by the designer/shipyard. Please note that the underlying principle is that the loading computer software shall reflect the required onboard documentation. In compliance with classification society recommendations, the “Bulk Carrier DDS” was put to use, which includes a direct damage stability simple run through damage cases for each bulk cargo hold to verify compliance with Reg. 4 damage stability, thereby meeting the ICLL Reg. 27 stability standard. This procedure has been implemented in CargoMaxTM and when required done simultaneously with the S17 hold flooded strength calculations. Since bulk carriers with deckloads can have a VCG even higher than the conservative 100 percent full homogeneous CG required by ICLL Reg. 27, these damage requirements are considered to be inadequate and need to be supplemented by the SOLAS B-1 probabilistic requirements, see IACS LL65. This means that even if the B-1 calculations with a higher VCG (lower Req. GM) are met, the relatively conservative VCG (high GM) from the Reg. 27 calculations at the deep waterline must still be used. In essence this stipulates that since ships cannot have cargo with a VCG higher than the homogeneous cargo hold, they are prevented from having any significant deckload at the deep waterline. Depending on the Partial Draft Req. GM to meet the B-1 damage requirements, ships can get progressively more deckload at lighter and lighter drafts. 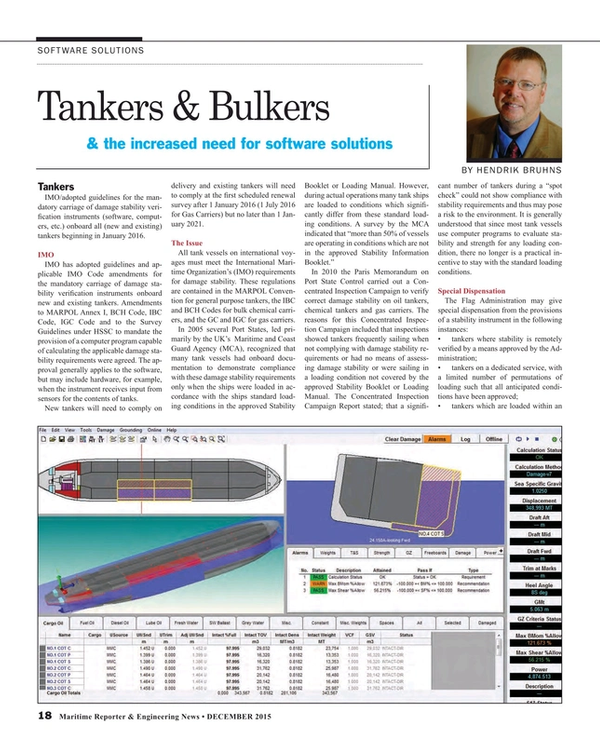 Hendrik Bruhns, Naval Architect, President of Herbert-ABS Software Solutions LLC. Previously he headed the Stability Department of Germanischer Lloyd and has participated in and chaired numerous Committees at IMO.